This recipe again comes from my great-grandmother’s (maternal) recipe collection. I am not sure who Estella Cox was, but I think she might have been a friend. When I first saw the title of this recipe, I thought it would be a soda bread, but then I read the recipe–it is an old-fashioned sourdough. I did not have any cornmeal so I used flour in the first sponge. 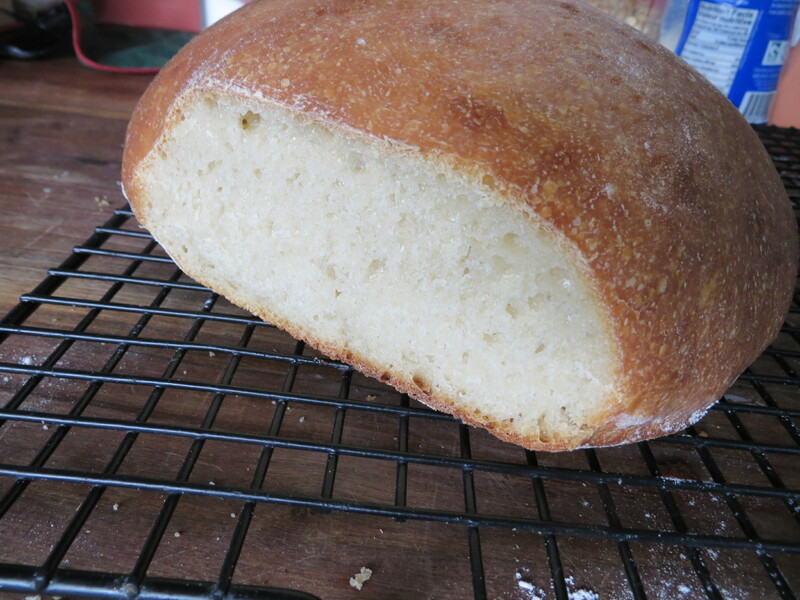 I am not sure if using cornmeal makes a big difference, but I let this bread (and the sponges) ferment for much longer than the recipe called for. I did not see the bubbles in either sponge for a few days, and then I let the bread “rise” for another day. 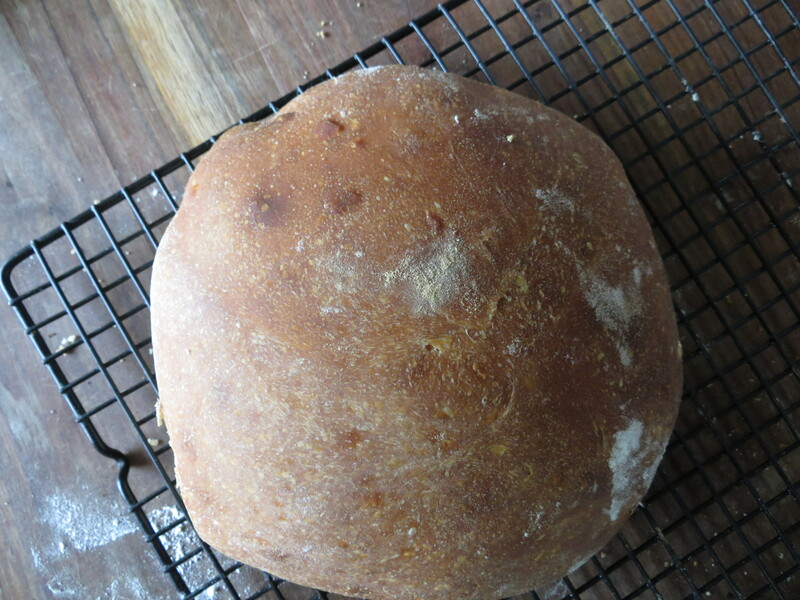 I was not sure it had worked at all but I heated up the oven on the 4th day and baked the bread on a stone. 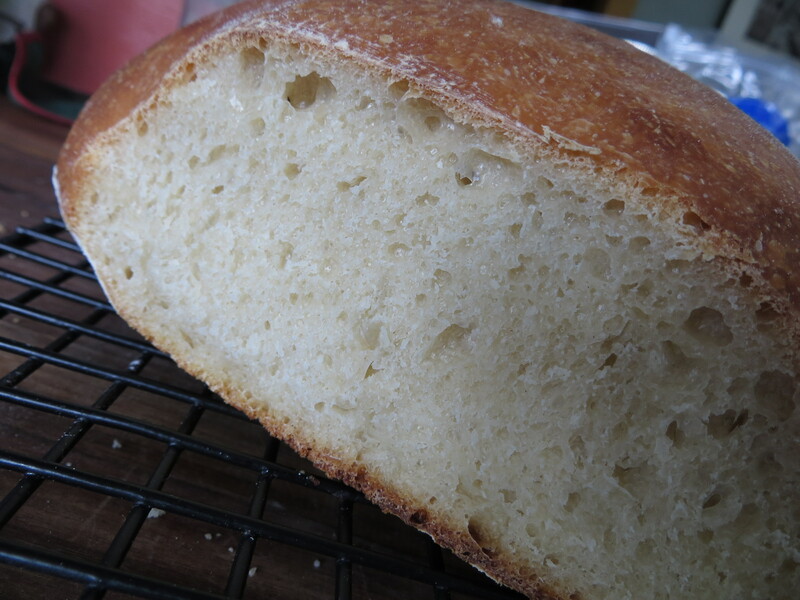 I thought I would be cutting into a brick, but amazingly (or not, to those of you who know about fermentation) the bread was fairly light and had lots of nice air bubbles in it. It tasted great too, moist with a very sourdough-y taste. Since I’ve never made a naturally risen, or fermented, bread this was impressive to me–the power of native yeasts! Scald milk, cool to lukewarm, add cornmeal, salt and sugar. Pour into covered fruit jar or pitcher. Place in pan of hot water 120 deg. Let stand for 6-7 hours or until signs of fermentation (gas bubbles) appear. Add ingredients for 2nd sponge. Beat thoroughly, cover, place in pan of hot water 120 deg. Let rise till very light then add remaining flour gradually till dough is stiff enough to be kneaded. Knead 10-15 min. Shape into 2 loaves, place in bread pans, brush top with melted shortening. Cover and let rise till very light, more than double. Bake in 375 deg oven for 10 min. Then lower heat to 350 deg. Bake 25-30 minutes longer. As I mentioned before, I did not use cornmeal, but flour, for the first sponge. Then, I forgot to sift the flour for the last addition. It took much longer to get fermentation bubbles in the first sponge, but I could not keep a consistent 120 deg bath for either sponge, and I didn’t even try. So, I am sure that slowed things down some. Finally, since I was not at all sure the bread was going to work out, I did not put the dough in loaf pans but just let it rise on a baking sheet. Even after a full day and a half, it did not rise to double it’s bulk. I finally decided to go ahead and bake it–at 400 for the entire time–and it turned out fine. I might make this again, just to see if I can get different results–better rise, etc. 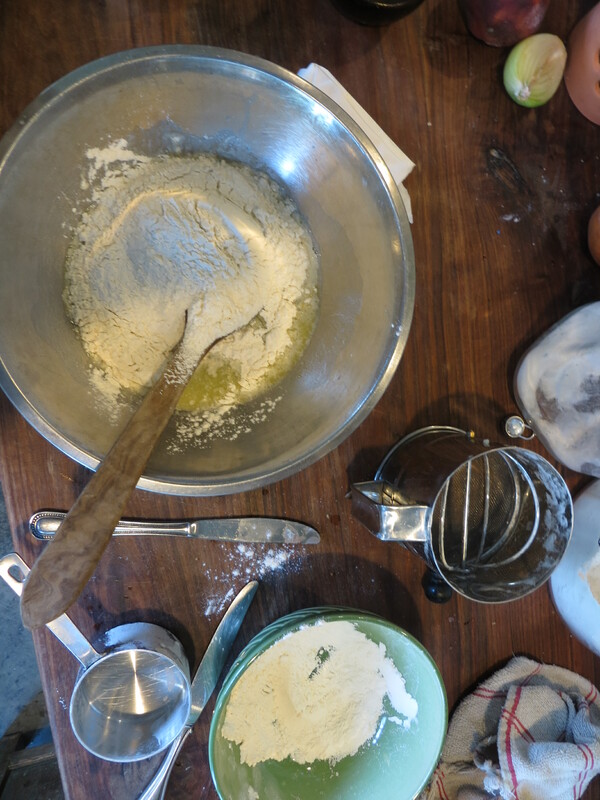 Anybody else have experience with making a sourdough sponge or bread? Estella Cox is or was auntie Ruth’s sister.